Kiowa County Sheriff's Office is on the scene of a fatal airplane crash in Eastern Kiowa County. 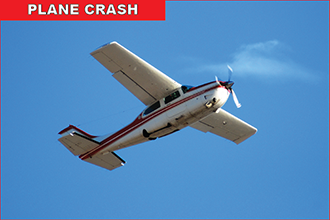 One fatality is confirmed following a single engine aircraft crash near Highway 96 and County Road 71. Representatives from the Federal Aviation Administration (FAA) and National Transportation Safety Board (NTSB) on enroute to the crash site to begin an investigation. The Kiowa County Sheriff's Office received a 911 call just after 9:30 a.m. Multiple agencies responded to the incident including the Kiowa County Fire Protection District's fire and ambulance crews and the Colorado State Patrol. The coroner is responding to the accident site. The Kiowa County Sheriff's Office will remain at the incident site until the FAA and NTSB arrive.